Spotlight on Indie Romance: 2018 Round-up. It has been a great year for reading. So many wonderful romances in all sub-genres produced by Indie authors. For the last post of 2018, my selected favorites. First up, my personal favorite: Science Fiction Romance (SFR). SFR comes in many flavors; military, settlers, cyborgs, alien-heroes, alien-villians, even alien-shifters. 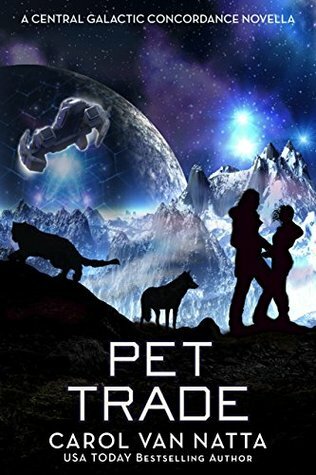 Carol Van Natta‘s Central Galactic Concordance series falls mostly into the military trope, but adds in a bit of cyborg, and in Pet Trade: A Central Galactic Concordance Novella, some settler-romance and a wonderful menagerie of genetically engineered pets. An injured veterinarian and a cyborg with unusual pets must join forces to save their town. It’s a deadly adventure—with pets—in the fringes of space. For those who enjoy more light-hearted romances, romantic comedy remains one of the most popular sub-genres.